The UAE has banned the import of chicken and eggs from the Netherlands following an alert from the World Organisation for Animal Health on a highly contagious H5N8 bird flu strain. 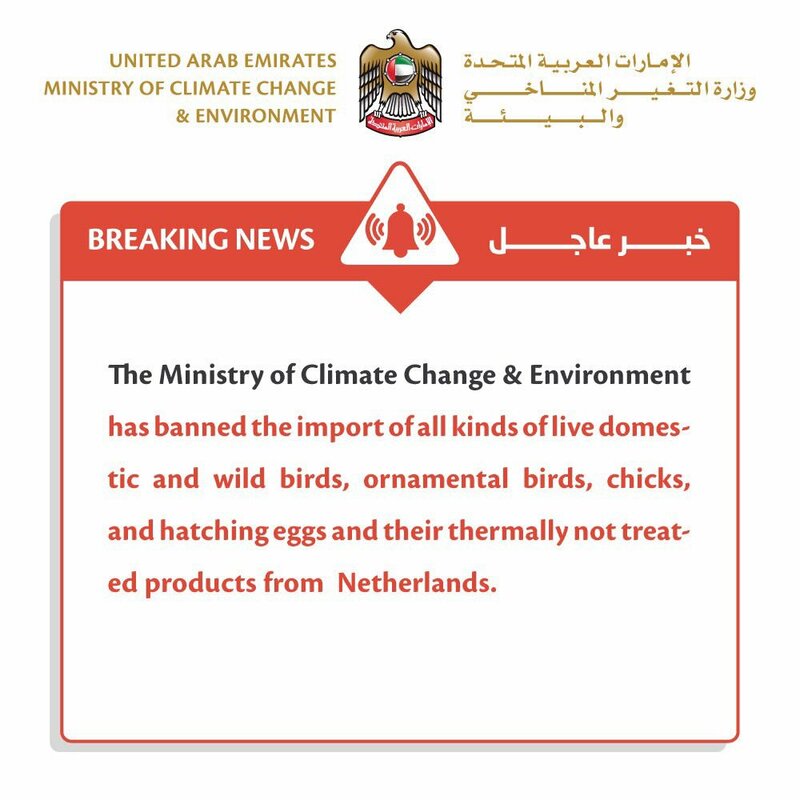 The ban extends to domestic, wild live birds, ornamental birds, chicks, hatching eggs and non-heat treated by-products from the Netherlands. More than 150,000 chickens were culled in the Flevoland province recently to prevent the spread of the outbreak of the highly pathogenic strain. Thermally heated poultry products from the Netherlands have been cleared for import, according to a statement from the Ministry of Climate Change and Environment on Thursday. Samples of all food products are being tested in laboratories with sensors used to check the quality, said Majid Sultan Al Qassimi, assistant undersecretary of the ministry’s food diversity sector. “These measures reiterate the ministry's keenness in eliminating pathogens before they enter the country,” he said. Documentation covering the origin, health and halal certification are being scrutinized to protect public health. The UAE last month banned the import of chicken and egg products from Saudi Arabia following the detection of the same bird flu strain in Riyadh. The avian flu infected and killed birds in the Saudi capital after which thousands of birds exposed to the virus were culled. There have been no cases of the H5N8 infection spreading to people, according to the World Health Organization (WHO). Although, while the likelihood of human infection with the H5N8 virus is low, it cannot be excluded, WHO has said. Earlier this week, the UAE banned live birds and meat from the central region of Kostromskaya Oblast in Russia following an outbreak of another contagious H5N2 bird flu strain.